Belt: Ceinture lunaire (random world drop) or Corde du champion assassiné (From Warlord Zon'ozz), etc. Cape: Linceul d'espoir de Kharmaa (sold by G'eras, in Shattrath City), Cape glaciale (made by Tailoring), Cape de l'immortel (drop from Watchkeeper Gargolmar in Hellfire Ramparts), etc... the possibilities are endless. According to @Niaw, the color of Echarpe d'Angelista is wrong. Sorry for misguiding. There aren't any available pants, of the same artwork and colour, for this set. If they existed they'd be in the same format as Jambières d'absolution, except the side panels would be white, the legs that same odd brown as the middle of the skirt, and the chainwork gold. The pants mentioned above, Jambards ornés supernels, aren't the same artwork as this set, unfortunately. Not a huge problem, though, since the pants are hidden by the robe. They also do match eerily well for different artwork! Sadly I can't find a belt or bracers of the same artwork and colour, either. From the artwork files, if the belt existed it'd look like Ceinture du conseil divin only the blue would be lighter and more turquoise and the metalwork would be bright gold to match the chestpiece. Echarpe d'Angelista, mentioned above, is too dark, unfortunately, and actually belongs to the "White" variant of the same artwork (the so-called "White" artwork set is actually mostly black!). Ceinturon de l'éclat de Néant, also mentioned above, is not from this artwork at all, even though the blue is a closer match. The bracers would resemble Protège-poignets de l'influence divine, only with the same colouring as the bracers, and a white band across the middle where the other has dark blue. There's no matching belt. The closest I could find was Ceinture de foi (priest t3), but I seem like the last person on the planet to still have it, and it's no longer obtainable. Well. There is -one- matching belt. The closest I could find was Ceinture de foi (priest t3), but I seem like the last person on the planet to still have it, and it's no longer obtainable. For this set, I like the Ceinture lunaire. It matches the brown, turquoise, and gold of the set quite well. It's a low lvl world drop, so good luck searching the AH for it, although Spiderkeg mentions below that he's had some success farming it from Dire Maul. Edited to add: Since everyone liked my belt recommendation, I'll add that when I wear this set, I use different gloves. Unlike the blue and red variations of this set, the white robe has really lovely sleeves that, unfortunately, get hidden beneath the set's poofy gloves. Wearing gloves that stay beneath the sleeves, like Gants de la flamme purificatrice or Gants ornés de dolomite, let you show off the unique art of this recolor. Don't trust wowhead's model viewer on this, as it has a weird bug where the art of the gloves paints over the art of the sleeves. If you want to see the sleeves, you can look at this model, with no gloves on at all. I think Corde de précision du gladiateur sans pitié is the perfect fit for this set. Blends perfectly with the robe. The only thing a bit out of place is the little green stone in the middle. The cloak commonly agreed to be the best match is Linceul d'espoir de Kharmaa. It costs 312 JP from G'eras, a Naaru vendor in Shattrath. If you prefer to have open sleeves in this set, like I do, Protège-mains de la flamme purificatrice works very well for this. The Ceinture de la plaie glaciale also makes for an average belt option, you can't tell it is out of place from a distance. Intensité off of Ignis le maître de la Fournaise matches this set to a tee, very nice addition for transmog. I've also seen a lot of suggestions for belts, but so far the belt i've found to fit best is the Ceinture de transcendance. The blue of the stone is an exact match to the blue highlights found in the robe. The only drawback is the priest-only specification, making it unavailable to other clothie classes wishing to get this set. Looking to get this set for my priest, the Bâton de la récupération immaculée, Ceinture de tempêtes arcaniques and Cape flottant au vent seem like excellent mats to finish this set. But that's just my opinion. I have been using Echarpe de la vérité sans fard for this set and I think they match fairly well. Don d'A'dal is the best belt option. It blends in perfectly! I like to use Réplique des gants vertueux for gloves instead. They hide under the robe which looks more attractive, in my opinion. Costs 55 darkmoon faire tickets. Another belt that matches the set is Corde de salut forgée par les Titans. It is also quite easy to obtain (as long as your faction has Wintergrasp. that is). If you are looking for a belt that fits this set, dont mind the other belts that has been posted here. Go for the Nethershard Girdle " Ceinturon de l'éclat de Néant " from Moroes in Karazhan. I found Corde de la chute d'eau to be a pretty good fit. Ceinture lunaire which is not farmable. well, it is, but the drop rate is ridiculous, and drops from a billion mobs, so. and is easily farmable. Drops from Ok'thor le Briseur, random boss spawn from Juge supérieur Mornepierre in Blackrock Depths. If you're a priest using a mace and looking for a matching MH, I suggest Pilonneur de Sporeggar. It is perfect! Ceinture à fermentation is another nice match to the recolor set. I like using Marteau du plan astral and Symbole de transgression together with this set. I believe the colors match really well. I also like pairing it with Corde de précision du gladiateur sans pitié because the gold chains work really well to match the set. I use Gants régaliens for gloves to show off the sleeves of this robe which are very different than the look of the gloves. I think it looks great together. This is the Item Set I use for it. I have a feeling Clé des plans would look perfect with this set! looked over the comments and saw my fave staff for this set wasn't mentioned! Apôtre d'Argus blue glow matches that on the shoulders and the color of the handle matches the rest of the set. Sorcelame du gladiateur vengeur fits this set if you're looking for a dagger. If you are very unlucky like me and the only piece that hasn't dropped yet is the chest you could temporarily use Robe de Koegler as a replacement. Its not the same but its gold, grey and blue matches the rest of the set and actually looks pretty decent. With a fairly good drop rate of just under 4% its easy to farm from Normal Mode Salles Écarlates (Level 31+ dungeon). I was able to do a single run in ~5 minutes on a level 90 priest (since its able to 1 hit everything at that level) and since the low level mobs cant hit you you just need to run through and pull everything to kill koegler at the end. Still no match for the original chest-piece though. I think Echarpe d'Angelista is the real match of this 'Absolution Regalia' recolor, and nobody said anything about it!. There are several belts that I think are good fits for this. My top pick is Ceinture céleste, but a couple other that are decent matches are: Echarpe de l'aurore, Ceinture éclatante and Echarpe de Jordan. Ceinture de foi matches perfectly with this set! Too bad it's so hard to get. I've never seen it on the black market. Goes great with Robe bénie de purificateur de mort-vivant. It finally payed off for being such a hoarder. Echarpe de la vérité sans fard or any other Dragon Soul normal priest belt looks decent with this set. same chest, hands, head, Spallières de l'abattoir for shoulders, Ceinture de matelot en corde for the waist, but only the normal drop, and Escaladeurs de troglodyte for feet, preferably the heroic ones. But as far as feet goes, too many items look almost the same. Also, for weapon, i use Averse de grêle with mongoose illusion, looks rad, and with these shoudlers and the whole thing, Tabard du porteur de Lumière goes pretty well. Actually Ceinture de la tempête fits really nicely, it's really simple and the style of the belt goes fantastically with the style of the actual set, it's a fantastic match and use it on my mage. Unfortunately it is only for mages. I have the regalia on as a mage. I get comments like "why is a mage dressed like a priest?" Ugh. People can shove it. I love it. A belt that works really well because it has a blue diamond on the front matching the blue diamonds on the robe is the Cord of Unhinged Malice Corde de malveillance délirante 710 ilvl. You can buy it from the auction house. The only back that I've liked with this is The Maiden's Tattered Sail, Voile rapiécé de la vierge which is a super easy pickup in Arathi from a quest. For the feet Bottes du bûcher-sorcier brodées work really well, the gold trim works really well with the robe. I'm amazed no one has mentioned this, but BY FAR, the best choice for a matching belt, is Ceinture du dernier hiver de soigneur or Ceinture de terreur incarnée that drops from Tsulong or Lei Shi in Endless Springs. If you dislike the big gloves that are a part of the set, Gants de l'amateur exilé are a good choice of gloves for transmogging purposes since they show up very little under the robes if at all. Imho i think Corde de cruauté du gladiateur tyrannique looks great with this set, easy to get and looks perfectly fine. I've done a little research and I found out that Ceinture lunaire is the appropriate match. 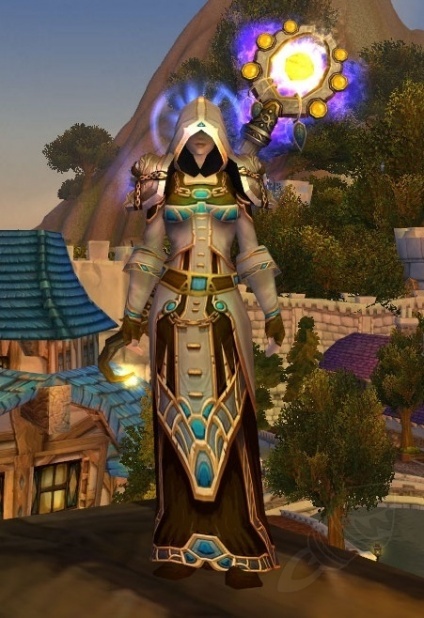 This is a transmog set that complements the Holy Priest legendary belt Al'maiesh, corde de l'espoir perfectly imho. My outfit version of the Absolution Regalia (Recolor) transmog set with some personal picks for shirt, cloak, belt and staff. Ceinture lunaire fits perfectly with the set. With this set I use Ceinture lunaire with Cape d'Aile de Grue,Bâton de vie de l'Ethereum, and Tabard du Lotus doré.